Aus 132/7 in 19 overs. 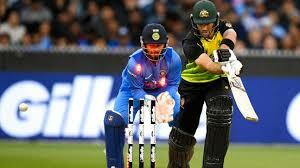 Get Ind vs Aus 2nd T20I live score, highlight. This is the 2nd match of India tour of Australia 2018-19. In this cricket match, India is playing with a new strategy because of the last chance to save the series. This match is being played in Melbourne Cricket Ground, Melbourne on 23rd Nov 2018. Hi friends, I'm Gyan Ranjan. In this blog post, you will get Ind vs Aus 2nd T20I live score, highlight and special moments of this cricket match. India is playing with a new strategy to save the series. India has had lost the 1st T20 cricket match of this India tour of Australia 2018-19 T20 series. But has the ability to win this match and series. India national cricket team worked on bowlers to grow the bowling performance. This is the new strategy which may be the key to success in this India vs Australia 2nd T20 2018 cricket match. D Arcy Short, Aron Finch(c), Chris Lynn, Glen Maxwell, Marcus Stonis, Ben McDermott, Alex Carey(wk), Andrew Tye, Adam Zampa, Jason Behrendroff, Nathan Coulter-Nile. Australia started the inning with great effort. But lost the wickets at regular intervals. The batsmen of Australia couldn't perform as well as they performed in the 1st T20. Because of the great performance of Indian bowlers. Glenn Maxwell 19, Nathan Colter-Nile 18, D Arcy Short 14, and Chris Lynn supported with 12 runs. Ben Dermott 32, and Andrew Tye 12 played well and collected some useful runs. Match Stopped due to rain in 19 0vers when the score of Australia was 132/7. Bhuwneshwar Kumar and K Khaleel Ahmed got the 2-2 wickets. While Krunal Pandya, Jaspreet Bumrah and Kuldeep Yadav got the 1-1 wicket in this cricket match. India lost the chance to win the series.